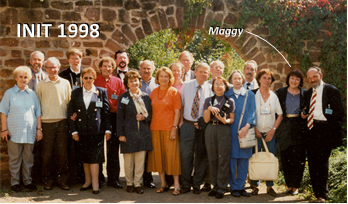 Maggy was very close to her father, Albert Fischbach, and when he died in the early spring of 1998, the Timestream spirit group planned something special for the two of them… and for humanity. Throughout the rest of the year a series of reports were received by Maggy and her family, through phone and computer, to update them on Albert’s experiences as he adjusted to the afterlife… and those reports contain some of the most insightful information ever shared with our world about the adventure we call death and afterlife. The story unfolds on both sides of the veil, so to help keep things clear in the following article, the events happening here on Earth are written in normal type, like this… while the events unfolding in the spirit worlds are written in italic type. Notes and explanations are indented. Albert is in a hospital bed, pointing occasionally at the ceiling where an invisible hole has formed that only he can see. Maggy and her mother sit bedside and can only guess what Albert is pointing at. Meanwhile, at Timestream, Captain Burton has told Bwele M’Banga that it’s time to bring Albert home… and to bring along Mother Anna (who is Albert’s mom and Maggy’s grandmother) to assist with the transition. Mr M’Banga is Timestream’s official guide and scout, an African… a close friend of English explorer Sir Richard Francis Burton. Bwele and Mother Anna hold hands as they enter the vortex with its thin walls that pulse in rainbow colors and cast a reflection of the two. They proceed slowly, because traveling to Earth is often fraught with problems. Not only is it difficult to enter Earth’s flow of time at the right point (hence the name “Timestream”), but there are various parallel Earths that have split off at critical times across the millennia. The most recent “splitting year” is 1933, when Hitler comes to power in Germany, an event that has an immense impact on the state of the world. It’s this “Earth-1933” split-off world that Bwele and Mother Anna are trying to locate. Another splitting year is 1651, when Isaac Newton dies of measles as a boy and never gets the chance to develop his mechanistic cosmology that becomes the cornerstone of science on Earth-1933. World civilization has evolved much differently on Earth-1651 without Newtonian physics. As the two travelers reach the end of the tunnel and look through, it’s obviously not Earth-1933, so they backtrack and try again. The second time they arrive at the end of the tunnel and see that the younger woman has blond hair and can’t be Maggy with her auburn hair, so once again they regroup. The tunnels, presumably, are created as needed and maintained by higher beings and superhumans such as Technician and The Seven, who have some mastery over the multiple dimensions and understand their complexities, and who facilitate the ITC bridges being developed between our “Earth-1933” world and Marduk on the Third spirit level, the home world of Timestream. On the third attempt they apparently come to the right place, judging by Albert’s thinness, frailty, and labored breathing as he lies, dying, in the hospital bed. As Albert breathes his last breath, Mother Anna emits a soft sob when she sees her lifeless son… but almost immediately she catches herself as Albert’s astral body rises, wearing an exact duplicate of the hospital gown that’s on the lifeless physical body. Albert approaches his wife and daughter for a final good-bye, but the two women are sobbing and don’t see him. So he embraces his mom with deep affection and asks, “Are we going home now?” Anna nods and takes her son’s hand as Bwele leads them quietly into the vortex. A few minutes later they arrive at nearly the same place on Marduk where their journey had begun that morning. Stepping out of the vortex, Albert is now wearing a dark blue suit and tie. He keeps looking down at the clashing wool socks and slippers on his feet. In the hospital room, Albert’s body is still in a hospital gown, along with the wool socks and slippers he had to wear near the end of his life because his feet were so badly swollen. In the coming days his body will be cremated with the slippers still on. Exhilarated, he dashes ahead, and Anna tries to keep up with her son, who’s looking around, trying to absorb the impressions of the beautiful hills and flowers and woods. “Everything is exactly as Maggy described!” he exclaims. As the three approach the House of Sleep, Albert recognizes some of the dogs and grazing horses on the green, succulent lawn. There’s a gentle breeze and warmth from the golden sun as Anna takes Albert to his room, an exact replica of the room in his family home in Alzingen. Albert will soon go into a deep, regenerative sleep that’ll last about four weeks of Earth time, and he’ll awaken at the peak of health in an astral body 25 to 30 years of age in appearance… but first he’ll partake in phone conversations with his wife and daughter Maggy back on Earth. Albert is still fatigued from his recent ordeal, but the Timestream group feels it’s important for him to try to tie up some loose ends before his sleep. Three hours after Albert’s transition, the Timestream group arranges for a phone connection to his wife Kennie, who is at home resting and grieving. As Maggy enters her flat she receives an excited call from her mom describing the phone call from Albert. Maggy and her mom both assume “the Black one” refers to Albert’s brother Jemp, who had jet black hair during his lifetime and was sometimes referred to as “The Black.” They have no reason to think that Bwele M’Banga is involved in the transition. The Timestream spirits often use words with double meanings. They might be trying to gently shake us on Earth out of any prejudices or preconceived notions… or maybe they just have a playful side. The day after Albert’s death, Maggy feels the full force of grief. After signing some papers at the hospital, she has severe chest pains that worsen during the car ride home, so she sits at the computer and types an urgent request to Technician and Timestream, requesting a contact from her dad. A few minutes later the phone rings, and Albert greets his daughter in a tired voice characteristic of someone who’s been deathly ill. He promises to contact Maggy again. A week later Maggy receives a call from Swejen Salter saying that Albert is resting well in his regenerative sleep, which will last about three more weeks. In related contacts, our spirit friends have intimated that some deeply etched mental and emotional patterns, such as severe addictions to drugs, alcohol and destructive behaviors, might not get healed completely during these regenerative sleeps… so upon awakening one might still be pulled to drugs or alcohol or addictive behaviors that can’t be gratified on the Third level. If the compulsions can’t be overcome, the person might have a premature reincarnation and carry the addiction into the next lifetime… or else be pulled into the shadow world where he becomes enmeshed in the lives of addicts and alcoholics on Earth. In any case, most people who die on Earth make a smooth transition to the Third level during their regenerative sleep, as Albert Fischbach does. A week after that report, Maggy’s husband Jules gets a phone call at work from Franz von Schafheitlin, a 15th Century German banker (Fugger) who’s now part of Timestream. Albert Fischbach apparently had also been a Fugger and a close friend of von Schafheitlin’s in another incarnation. Franz explains to Jules some of the difficulties we on Earth face in trying to make meaningful contact with our departed loved ones. In usual fashion, the strong emotional connection that Albert enjoyed with his wife and daughter during lifetime, disappeared after his transition. Earthly longing, which is fueled largely by hormones and ego, is a coarse sensation indicative of the physical body, and it does not accompany the more finely spun astral body into the afterlife. So, our grief and longing after the death of a loved one has a sort of bristling energy that presents an obstacle to comfortable communication between heaven and Earth. Two and a half weeks into Albert’s regenerative sleep, Swejen calls Maggy to report that her dad is looking younger… now about 50 years old in appearance. After four weeks, Swejen calls again to say that Albert will soon be able to contact his wife Kennie and daughter Maggy. Albert calls Kennie at home while Maggy is visiting, but he can only whisper because his throat is dry and he isn’t yet accustomed to his new, young voicebox. He also sounds confused, having just awakened from a long sleep and not yet being fully acclimated to his new world. Albert: A nurse was just in my room, and she told me to phone you at once. That’s what I’m doing. Maggy: So you have a phone! Albert (impatient): Of course I have a phone. Maggy starts asking a series of questions, and Albert becomes more flustered…. Albert (interrupting): Maggy, we can’t go on this way… you asking me all these questions that I can’t answer. I just woke up and called you immediately. My throat is dry and feeling very strange. Maggy: Ask the nurse for water. Albert: Yes, I’ll do that. Listen, tell your mother to stop crying. It will disturb things. Maggy: Surely you understand how she feels. Albert: Yes, I know, but… I think it’s okay now for you to ask some questions. Maggy is struggling with her own emotions as she starts to gather some questions… when the contact abruptly ends. Jules is surprised. It’s the same greeting that his father-in-law always used when the two of them encountered each other in lifetime. As usual, the familiar greeting on this occasion leads into a short, pleasant personal chat. Albert begins making regular contacts with Maggy. In his first computer contact he reminds Maggy that crying and heavy grief make these contacts difficult. Computer contacts are just as vulnerable as phone calls to human emotions. He asks Maggy and her mom to try to lighten up, and just to enjoy the open communications while they last. He also says he’s met Paracelsus, the 16th Century father of holistic medicine who’s part of Timestream. In a phone contact to his wife he says he understands her grief, and while it’s an obstacle to ITC contacts, Timestream is trying to adjust their equipment to filter out the emotions. If successful, it could be a major advance to ITC. A few days later Albert sends his second computer contact while sitting in his beautiful new room, typing on his old Underwood typewriter that’s in perfect condition. Albert says that although his body and mind are working better than ever, he’s having some difficulty remembering what day it is. He’s losing his sense of Earth time. A party is thrown in his honor and he’s able to eat and to enjoy the love and camaraderie of many friends who’d preceded him in death. During lifetime, Albert always made it a point to mispronounce Swejen Salter’s name as “Swe-tchen.” Maggy often corrected him… Swe-zhen… but his mispronunciation persisted. Swejen and Albert have a heart-to-heart chat, discussing the difficulties of adjusting to the Third level, with Swejen reminding him to keep Maggy and Kennie in mind, for the sake of ITC, since it’s easy to lose oneself in the wonders of paradise and to forget one’s recent Earth life altogether. There’s apparently a decision many people have to make on the Third level, where human dispositions and attitudes are much as they had been on Earth. If they wish to ascend to finer realms, they’ll be encouraged to detach from Earth… to forget about their carnal lifetime… since the density holds them back spiritually. On the other hand, if they wish to partake in a project like ITC, which involves opening and sustaining a communication bridge between Earth and the Third level, then they’re encouraged to make an effort to keep their Earth memories alive… to foster the relationship with loved ones still living on Earth. Then, leading Albert outside, Swejen introduces him to his new car… a magnificent red-orange Pontiac Firebird with white leather interior. Cars, especially big American cars, were always an important part of Albert’s life on Earth, and he’s very pleased now to be getting this vehicle. In his next contact he tells Maggy about his driving experiences. Swejen directs him to a park with a big red and white umbrella and a feast spread out across several picnic tables, where Albert parks the car. It dawns on him that he’s been in this world for several weeks and has never been hungry. The feast park would become Albert’s favorite place for a while, and sometimes he calls Maggy from there. She hears and records the birds singing loudly and a creek gurgling nearby. This entry was posted in Uncategorized and tagged Albert Fischbach, Life on the other side, timestream. Bookmark the permalink. Mark, Thanks for this summary. Nice to have it in one place. I look forward to the next part! Always great to hear from you, Nils. Glad I’m able to share it all here. Do you ever hear much from the other INIT members? Might be nice to have a reunion at some point…..
What a rich post, Mark. I’ve been talking to my fourteen year old (and very interested) grandson about parallel universes, and this post has given me much more to share with him. I had not thought about this aspect of interdimensional travel, the risk of getting into the ‘wrong’ earth or earth time, not from the spirits’ side, that is. Most intriguing, all of it. Wow, that’s amazing information. The phone conversations remind me of Dr. Gary Schwartz’ “soul phone” that is supposedly under development, along with possibly a couple others who are trying to develop a “cell phone” for talking to the dead that anyone can use. Hi George, yes, it was amazing, Maggy’s experiences. Lots of people have tried to make tech devices to contact the dead. The few who succeed have special gifts… especially a rapport, or resonance… a sensitivity. So even though I’ve said it before, it begs repeating! I feel the need to thank you Mark, for making this amazing & life-changing information available to us all. It’s such an amazing life’s work & the time & effort in your commitment is obvious. I have always wondered how many people must have wanted to make agreements with you to communicate with each other after passing…?? I couldn’t think of anyone better to try & make the connection with! Have you made any plans or preparations to do so when you pass? Are you still in touch with anyone from the other side? Thanks for everything! I hope all is well with you! Wonderful comments. Thanks. I’m no longer in contact with the other side via ITC channels, but I seem to share information with them fairly often in my dreams and meditations. Resuming ITC work after I pass is a good bet for me, but then again, so many possibilities open up when you leave the Earth, it’s impossible to say for sure. Who knows what I’ll actually be called to do on the other side?… but I’m open to any good possibilities. I’m not sure if it’s a sad &/or bad thing for you that you are no longer in contact with those on the other side, & I don’t want to pry if it’s too personal… But I was wondering if it was a choice on your part, or is it because of a technical reason? Has it made you sad? Or was it something where you felt you learned all you could learn? Maybe the communication field is an issue & is just too weak right now to make any contact? I know the 90’s were considered the “golden age” of ITC… It must have been so exciting being a part of all that! But for me, that would also make it much harder once things ceased to happen… Why did things break down? Did you receive goodbyes or reasoning from those you know well on the other side? Or was it more of a sudden thing? If it is true that the contact field or bridges are either too weak or non-existent, I wonder if it is simply due to the state of the world right now… Maybe the collective consciousness isn’t strong enough at the moment? Or is there something “blocking” progress in this field right now? What do you think about the things going on at CERN?